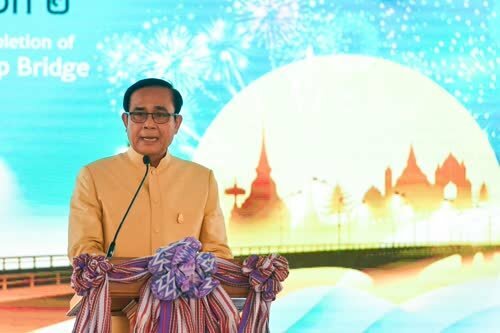 TAK, 20 March 2019 (NNT) - Prime Minister Prayut Chan-o-cha met with some 10,000 villagers of Tak province who welcomed him during the opening ceremony of a second Thailand-Myanmar Friendship Bridge. He congratulated the local villagers for the new border-crossing bridge, saying that it will bring about further developments and opportunities. He reassured the government was taking care of all 68 million people and called on the villagers to adhere to the Sufficiency Economy Philosophy and cooperate with the government, as Mae Sot district is highly capable of many more developments in terms of tourism and natural resources conservation. He said that he has been working to solve pressing issues in the countries over the past five years, including corruption, waste, traffic, occupational land rights, illegal fishing, and aviation safety concerns. He said the government has been working to improve the people’s quality of life and develop the agricultural sector with market-oriented approacesh to produce products to meet consumers demands, including the GI farming project, safe agriculture project, mixed farming, New Theory agriculture, and the implementation of online tools. He said the government has been promoting education equality by offering 25,000 baht annual scholarship for students in need, which has helped some 7,000 students; while the Damrongtham Center has received and solve some four million complaints from the people. Not getting very far then. You would think the press would be full of crowd photos of such a large gathering. Absolute BS, if he even met 100 the photos would be plastered over the media. He said he had been working over the past 5 years to stop corruption, traffic issues etc. The man is worse than Pinnochio. As usual, he does not know why he there or what he is doing. Why specifically did they build that bridge? Would like to know what economic benefits there are. Spoke to a Chinese Thai on the Malay border. He knew the benefits of where he was. He traded in food with the Malaysians. He spoke Mandarin, so could communicate with the Chinese on the other side of the border. including corruption, waste, traffic, occupational land rights, illegal fishing, and aviation safety concerns. of his cabinet to buy new BMWs. It was reported in social media that his office sent out notice to the village heads to muster the attendees at what ever costs. Copies of that notices were circulated in social media. Yes, amazing what he did with absolute power and no opposition parties to face. This is a forum. People can post whatever the moderators permit. If you don't like it, then you know what to do! If it upsets you, don't read the posts. What a ridiculous comment, i certainly am not a loser, came here after i retired. I like most on here are criticising an unelected bunch who stole power using war weapons. The fact that you dont like it, i dont care. He forgot extrajudicial killings, people smuggling, labour exploitation of immigrants ( or are these tings not for discussion in polite company ?